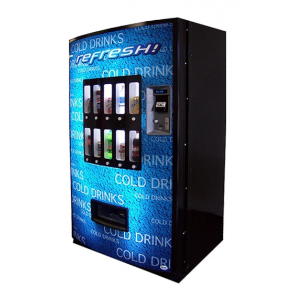 With the ROYAL 650 Live Display Drink Machine you can vend 10 differently priced items ranging from 12oz cans to 24oz bottles. With the live display machine all you have to do is place the product in the display window in the door. No flavor strips to keep track of. Works well in medium to large locations. 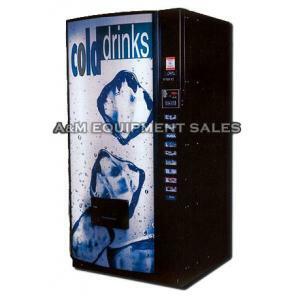 The Royal 650 Live Display Drink Machine. 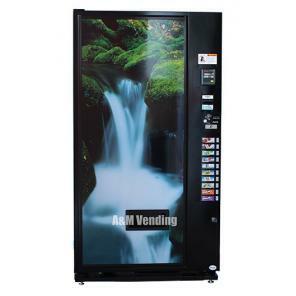 The Royal 650 Live Display drink machine has for the last 15 years has had innovations such as energy management software, low power led lighting, and the factory has minimized waste streams as part of Royals culture. Royal vendors has had a formal environmental policy for the past ten years. The Royal 650 live display machine has 10 selections with 12 columns enabling you to double up on two good sellers. Capacities: 648 – 12oz. cans, 288 – 20oz. bottles. 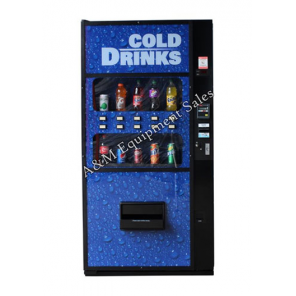 The machine has a vandal resistant exterior, LED display, programmable options, delivery chute sensor and menu style programming. Dimensions: 72″h x 37″w x 35.5″d. Shipping weight approx: 725 lbs. Price with new changer and validator $3,365.00 USD. Parts warranty on new: 5 years compressor, 3 years electronic boards, 2 years on new changer and validator. Shipping not included. We are an authorized distributor for Royal Vendors. Each vendor is backed by our dedicated support team, with most over 20 years in the business. Our telephone technical support and parts team will be happy to assist you with any issue you may have Monday – Friday 8am – 5pm EST.